Honor has officially unveiled its newest mid-range smartphone the Honor 10 Lite in China , The handset features a 6.21-inch screen with tiny notch, Kirin 710 chipset, and Android 9.0 Pie. Honor 10 Lite is the company's latest mid-range Android smartphone. The Honor 10 Lite, as the name suggests, is the mid-range sibling of the Honor 10, but the two are very different devices, not just with the specs but with the design as well. 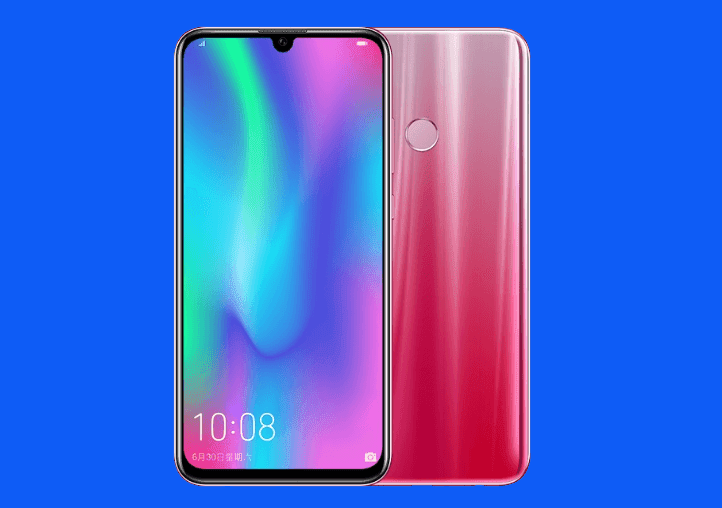 To cite some examples, the Honor 10 Lite has a smaller notch while the fingerprint scanner is placed at the back, making room for a larger screen. The Honor 10 Lite is a toned-down version of the Honor 10, the Honor 10 Lite comes with inferior specs than its big brother. However, Honor was still able to arm it with refreshing features. Dressed with a trendy metal and glass body with a gradient style, the Honor 10 Lite flashes a 6.21-inch FHD+ panel with a tiny waterdrop notch, resulting to 2340 x 1080 pixels. Under the hood, the Honor 10 Lite is packed with a Kirin 710 chipset complemented with Mali-G51 MP4 graphics. Honor equipped it with the new GPU Turbo 2.0 technology, thaw will allow it handle heavy tasks such as gaming. The device can be coupled with up to 6GB of RAM and 128GB of internal storage. The Honor 10 Lite boasts 3400mAh battery and runs on EMUI 9.0.1 Android 9.0 Pie. In the camera department, the Honor 10 Lite sports a dual-rear camera setup composed of 13-megapixel f/1.8 and 2-megapixel sensors. For selfie, the device is mounted with a 24-megapixel snapper that supports AI face beauty to enhance your photos. The Honor 10 Lite is priced at CNY 1,399 (~Php10.6K) for the 4GB/64GB variant, while the 6GB/128GB model sells for CNY 1,899 (~Php14.3K). The handset will be available beginning November 22 in China.